BOTOX® is the world’s most popular non-surgical anti-ageing treatment, due to the results that can be achieved with skilled Doctors such as our visiting aesthetic practitioner Dr. Helen Christie BDS MFGDP. It works by temporarily blocking fine muscle activity, which allows the skin to relax so that lines appear softer and smoother. The first step of the process to having any cosmetic treatment at S3 Skin and Laser is to arrange a consultation with Dr. Christie. This entails a detailed examination and discussion of what you are trying to achieve, as well as taking a medical history. Only then can Dr. Christie recommend the most appropriate treatment to suit your needs. She may advise laser or fillers instead of BOTOX if that could lead to a better outcome or be more suitable for the patient. BOTOX® is the trade name for a drug called Botulinum Toxin A. This drug has been safely used for multiple indications for over 20 years in medicine. It works by temporarily blocking the activity of treated muscles. The skin overlying these muscles relaxes which leads to a softening of fine lines and wrinkles. There are now a number of different brands commercially available. BOTOX is a prescription only medicine which must be prescribed by a suitably qualified professional after face to face consultation. 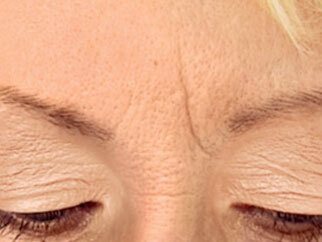 BOTOX® is primarily used as a treatment for dynamic facial lines. These are lines that are produced by facial expressions such as frowning, lifting the eyebrows and around the eyes when smiling. It can also be used to lift eyebrows and the corners of the mouth. The trend at present is for a more natural look than previously. It is possible to achieve excellent results without looking “frozen”. Botulinum toxin is a protein produced by the bacteria Clostridium Botulinum. This bacteria causes a form of food poisoning known as botulism. In this situation the live bacteria is ingested and releases large amounts of the toxin producing illness. Cosmetic procedures involving botulinum toxin involve introducing only very tiny amounts of the purified protein into specific small muscles in the face. Common side effects are very mild and short lived. Common side effects are local swelling like a nettle sting for a few minutes up to an hour, bruising and headache. Up to 10% of patients experience a headache after first treatment. It tends to be mild and settle with simple painkillers such as paracetamol. Rare side effects include temporary heaviness of the eyebrows or eyelids. These tend to improve within a few weeks. Results typically last 3-4 months after initial treatment. With repeated treatments results may last longer, particularly in the forehead. BOTOX® is charged per area. Prices start at £150 but vary according to your specific requirements. For patients planning to maximise results by having regular treatments throughout the year, we offer a payment plan which reduces the cost of treatment by up to 20%. Dermal fillers are an alternative injectable treatment. Rather than relaxing the muscles, fillers work to add volume into deep lines, such as the nose to mouth or forehead lines. They can also be used to add volume to the lips. Fillers can be used in addition to BOTOX® as part of your overall anti-ageing treatment.